Waffle Sweater Tunic Just $18.99! Down From $35! Shipped! 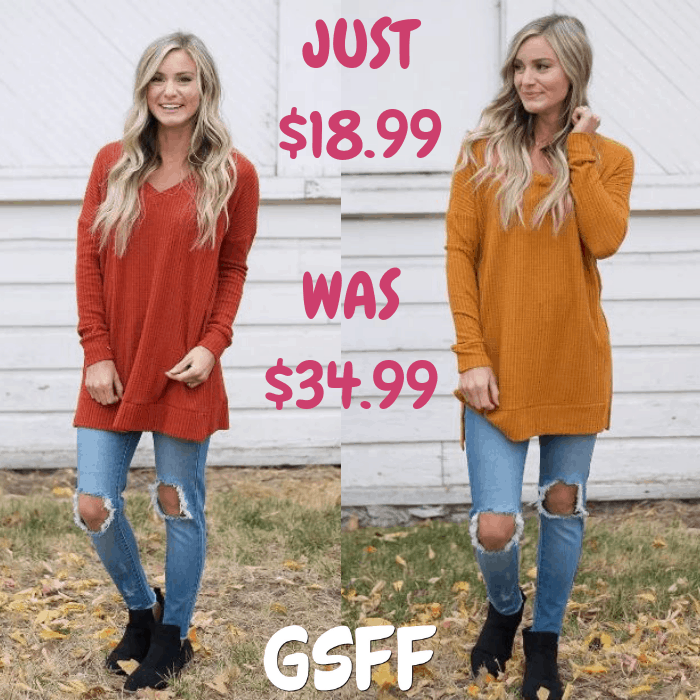 You are here: Home / Great Deals / Waffle Sweater Tunic Just $18.99! Down From $35! Shipped! Jane has this Waffle Sweater Tunic on sale for just $18.99 down from $34.94 PLUS FREE shipping! You are going to want one in every color! This Waffle Sweater Tunic is incredibly soft and cozy! It is perfect for leggings or your favorite pair of distressed denim and booties! It features long sleeves, a v-neck, and adorable side slits. Style is meant to run large. If you would like a tighter fit, size down.